The King’s eyebrows lifted--revealing his disbelief. “More Dragons?” He mouthed the words in an alarmed whisper. The messenger nervously nodded. Dragons had not been in the Realm for centuries. Not since the days when the High Wizard Amarak advised the Royal Court. But now, not only had the Blue Dragon attacked the settlements on the frontier of the Blizzard Mountain Range with an army of her dragonkin, but other new Dragons had been sighted, clearly in the service of the Dark Lord’s army. Hemlock, perhaps the most evil of all of the Dragon Generals, was en route from the East. Brimstone was already setting fire and laying waste to settlements near the Realm. And Onyx, the most feared dragon of all, was fast approaching from the North. The King contemplated the bravery and skill of his Heroes. The Defenders of the Realm: Dragon Expansion allows players to increase or decrease the difficulty level of gameplay using variants and scenarios. 3 new Dragons, 3 Agents of the Dark Lord and 4 new minions enter the Realm! Defenders of the Realm is a superb board game. It is, without doubt, one of the best co-op board game on the market. The Dragon Expansion, added many new features to the game. 1) The introduction of 3 new generals. These new generals are all dragons, and each have different abilities, adding difficulty and challenge to the game. Also, the expansion comes with 3 agents of the dark lord cards. This means, you can customize the game and use any of the new generals as “agents of the dark lord”. This really added another level of customization, while making the game quite challenging to play. 2) The introduction of new minion types. These minions ramp up the difficulty of the game a fair bit, but makes the game very exciting, keeping you on the edge of your seat whenever you are drawing a darkness spread card. 3) The expansion also comes with a whole new set of hero cards, and a new set of darkness spreads card (together with global effect cards). You can also customise the global effect card to make the game easier or harder at your choice. 4) Royal blessings and tokens, players can use these tokens to make the game easier. 5) King’s champion variant. This variant allows players to earn fame in the game, getting rewards which give bonus effects to their characters. This is a very fun variant, especially in a game with large group of people. 6) The rule book also introduced scenarios, these scenarios are fun to play, and added some campaign feel to the game. The component qualities are as good as usual, the new general miniatures (the 3 dragons) are painted miniatures. They don’t look as good as the original Sappire pre-painted miniature you can buy from Eagle games, but it is still very nice to have painted miniatures, as it is better than not being painted. The gameplay of this expansion is superb. The new features makes the game a lot harder to win, but at the same time, the challenge is welcomed, and added even more replay value to the game. Overall, I really enjoyed playing this expansion. Since I got this, I never played another Defenders of the Realm game without it, sometimes I use the original generals but use the new generals as the agent of the dark lord. Anyway, there are a lot of freedom to customize how you want your game to play now. Should you buy this? Well, this is definitely not a cheap expansion, but if you are a fan of Defenders of the Realm, then I would say yes, the added elements in this expansion will add even more mileage to this great board game. Personally, I can’t wait for the next expansion to Defenders of the Realm! This is a fantastic expansion that adds to an already fantastic game. While the Defenders Base Game is one of the most re-playable games for my gaming group, the Dragon Expansion brings it to a fantastic new level. 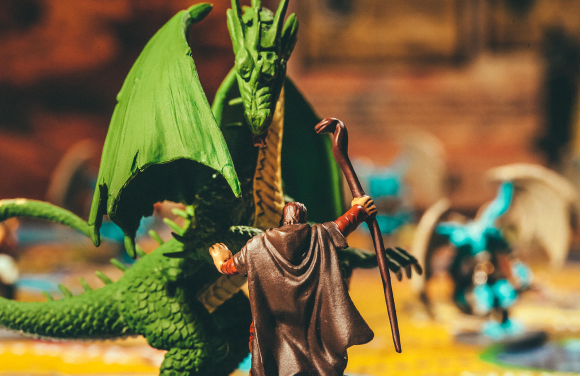 Being primarily a D&D group, finally being able to go up against 4 Dread Dragons and their assorted minions makes it feel like a classic D&D quest — one in which no one has to sit on the sidelines or DM the match. The co-operative spirit is especially fantastic, and the heavy incorporation of games theme make each play-through instantly unique and memorable. Anecdotally, we once had a player Solo Hemlock (the Green Dragon) with the Eagle Rider. The Eagle Rider defeated the Dragon, but perished in the process. When that player chose a new character, he also drew the “Friend of the Eagle Rider” legend card, and began to enact vengeance across the land for his fallen friend! It’s instances and stories like this that have made the game such a fantastic play for us, and will forever remain at the top of my gaming shelf. As the players gathered this day we decided it was once again time to defend the realm from the evil in the world. This would be our second attempt to save a realm from the clutches of the four evil dragons. Once again we took to defend the realm with the Cleric, Elf Lord, Chaos Mage and Paladin. We had gained some valuable experience fighting them in the previous realm and we were determined that they would not beat us again! As the Dragons moved into the area we started out for only the importance quests that would help us to defeat the dragons. John the cleric’s quest would stop one of the generals (dragons) power in combat from working this would allow us to have an even up battle with one of the dragons and this was our most important quest at the time. The down side of the quest is that you pick how many dice to roll for it and all non six’s are wounds. John the Cleric choice was four dice. He rolled one six and three misses so he suffered three wounds. In the mean time the Chaos mage was trying to clear out a pack of three black dragon imps and missed them all that inflicted 3 wounds on him as he retreated he lost another wound to the green imp in the space that he moved to leaving him only one action next turn. As things again turn gloomy for us when the Green imps are starting to get to the over run point Mike the Paladin draws a special card that allows all hero’s to regain all lost hit point. We attack the green imps with a great slaughter and we get them back under control as we prepare to attack Onyx. The great Black Dragon Onyx is our first target and the three of us attack without the support of the Chaos Mage. In a battle of epic glory we destroy Onyx and his fall is a great victory for our heroes as it is the first dragon ever slain in the realm. The four great heroes now start to talk about dragon hunting and which dragon should be next. At this point we are doing well with only three taint on the board and no problem with out of control imps but we do notice that we have five raging fires on the board so we count up our red cards. Yep the next dragon to attack is going to be Brimstone. We start to head to his current location and as three of us get there Brimstone realizes he may be in trouble and start to leave but the special card held by the Chaos Mage prevents any general from moving. The Mike the Paladin leads the attack on Brimstone and John the Cleric uses his quest card to stop Brimstones combat special and thanks to four hits rolled by Debbie our Elf Lord Brimstone goes down in a ball of flame. The people of the realm now have some hope. As our brave heroes now have a renewed confidence plan out what is next. They decide that we have to clear some of the imps out of the realm and that we need to gather the equipment (cards) to do anything else to the dragons. So off they go attacking the evil in the realm and clearing both taint and flame. While our heroes are off doing this Sapphire moves closer and closer to Monarch City. We now have what we need to deal with Sapphire so off we go to take down the Big Blue. We are there and we attack Sapphire and John the Cleric rolls his six dice and misses, a huge gasp goes up but again a special card is played to allow the Cleric to reroll all failed dice and he gets 3 hits. As with our group we rely on Debbie the Elf Lord to roll good dice and she does it again and we scratch Big Blue Sapphire. That leaves just Hemlock to deal with and we have ten green cards between the four of us so we decide to go for it. John the Cleric is the first to arrive and he clears out all of the imps, but the green imps start to spread again and the taint is now at five. So we keep on with our plan and in comes the Paladin and his darkness spread cards add two more taint and more green imps into play. This is getting close but onward and upward. The chaos mage teleports into our location and plays a special card that allows him to move any hero to his location so he drags the Elf Lord. Now we face the last of the dragon hoard and we start the combat, The Cleric, Chaos Mage and the Paladin all roll and guess what. We need the Elf Lord Debbie to do it again we need three hits on her four dice to win the game or we are DOOMED. You guessed it DEBBIE COMES THRU AGAIN. Getting the three hits we need. Let the party begin as the kings banquet is in our honor as we have defeated the four dragons. This expansion makes an already challenging game 10x harder. Still this game has some really cool components and I still want to play it even though I know I will probably be slaughtered by the dragons! 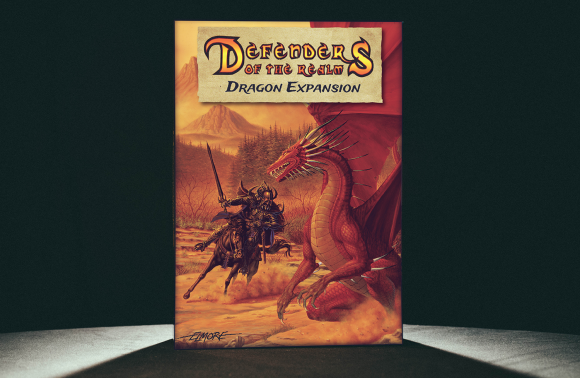 Add a Review for "Defenders of the Realm: Dragon Expansion"